This is the statement David Genovese, CEO of Baywater Properties, gave before the Planning & Zoning Commission and Architectural Review Board on Tuesday before describing his development proposal (main article here) for the area bounded by the Post Road, Corbin Drive and Interstate 95. David Genovese of Baywater Properties making a point about his project to develop the Post Road/Corbin Drive/Interstate 95 triangle downtown. Good evening. My name is David Genovese, and I am an almost lifelong Darien resident and the founder of Baywater Properties. With me tonight for our presentation is my father, Rocky Genovese, our partner in this project, Penny Glassmeyer, and our advisors in this effort. Our team includes Gary Brewer, Eric Silinsh and Peter Harmatuck from Robert AM Stern Architects of New York, John Block from the civil engineering firm of Tighe & Bond, and our legal advisor, Robert Maslan of Maslan and Associates. Bob Gibbs of Gibbs Planning Group has been working with us on this project for several years, as our retail planning consultant. Unfortunately, Bob Gibbs could not be with us tonight due to a longstanding commitment. Both Bob Gibbs and Robert Stern will join us for our follow-up presentation to you in the fall. The project we will present to you tonight is a complex one, perhaps the most complicated project ever presented to the Planning & Zoning Commission and the Architectural Review Board in their respective histories. A close-up view of the model, the nearest building would stand where the Bank of America building is, today. Interstate 95 is at the bottom right. At the top, near Genovese’s finger, is a model of stores and (behind them) a parking garage that might be built in the future when Market Lane might be extended to Center Street. This version of the model also includes a possible replacement building for the gas station downtown (the manila-colored model farthest toward the upper lefthand area). Our goal for tonight, however, is a simple one. We want to start a dialogue with you and the people of Darien, and we want to get your feedback on our ideas for what we believe is a catalyst for taking downtown Darien to the next level. Penny, my father and I, through our interactions with so many residents of Darien, believe that we have a very deep understanding of how they would like to see the downtown evolve. We have been working on the assemblage of these properties for over 10 years, and so we have had an enormous amount of time to discuss with people their thoughts and dreams about what downtown Darien could be. This project is a reflection of all of those conversations. I want to also let you, and the public know, that we are going to launch a website which will have renderings and drawings of our ideas, as well as information which we believe may be helpful to consider in thinking about our project. This information will be available to all, so that residents who don’t have time to come to a public hearing can easily review the details of our plan, and send us comments and reactions. The website for the project is www.liveworkplayindarien.com, and there will also be a link from our website, www.baywater.net. We have assembled what I believe is a world-class team to assist us in planning for what I believe is a once-in-a-lifetime opportunity to re-imagine downtown Darien. Robert AM Stern Architects is one of the world’s most respected architectural firms. Robert Stern is currently the Dean of the School of Architecture at Yale University. Gary Brewer, Bob’s partner, is the lead architect for our project. Gary is internationally recognized in his own right, having designed many important buildings at the Darden School of the University of Virginia, Brown University, The Ocean Course Clubhouse at Kiaweh Island, and many others. What drew us to Gary and Bob was their firm’s reputation as master planners and architects, the high quality of design of their projects, and their recent work in Charleston, South Carolina, a town with as rich a tradition in architecture as you could find in the United States. Bob Gibbs, our retail planning consultant, is one of the leading experts in new urbanism and retail design and merchandising. Many of you may have visited Naples, Florida, whose shopping district would likely rank as one of the finest in the United States. Bob was the lead advisor in the creation of Fifth Street South, and its merchandising plan. 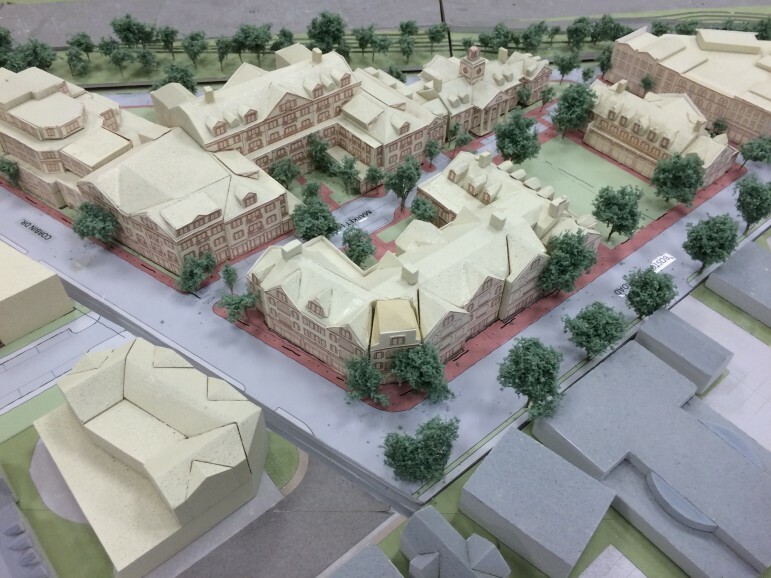 Another view of the model, looking southeast from the corner of the Post Road and Corbin Drive. 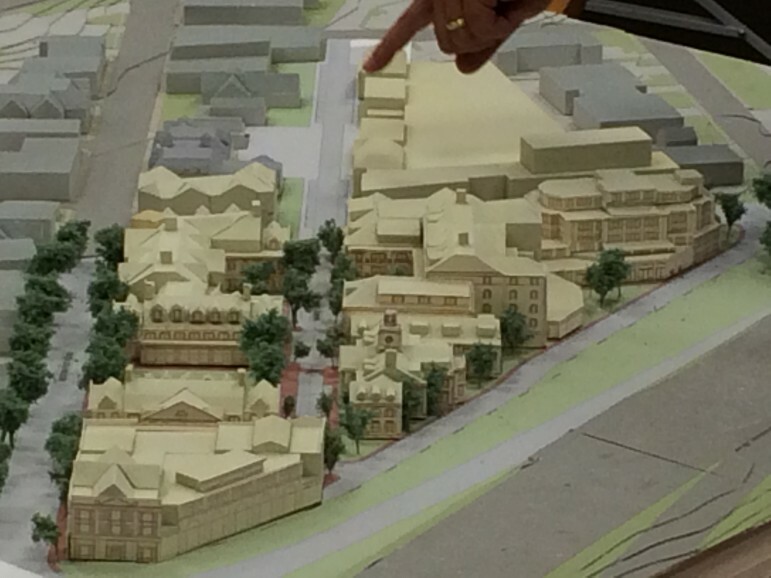 This model shows a possible replacement for the current gas station (lower left). The Darien Playhouse building is at lower right. As a town, we have made great progress in improving the vitality of our downtown since 2004 or so when Penny’s Grove Street Plaza was completed, and the Darien Playhouse re-opened. Many new restaurants have opened, new stores have arrived, and we now have an abundance of choices of places to meet, dine and shop. Penny and I, and others such as Ken Kleban and Albert Orlando, have built rental housing units which have brought residents to downtown. Whole Foods has opened, and downtown Darien is no longer the sole weakness in the desirability of Darien as a place to make your home, relative to our neighbors in New Canaan, Westport and Greenwich. When I started working with a group of volunteers on the Darien Revitalization effort in 2003 with the objective improving downtown, we would hear often from residential brokers in Darien about how they would avoid driving through downtown when touring homes with potential homebuyers who were considering Darien as well as New Canaan. Today, we hear nearly daily from residents about how great the changes have been to downtown. We see friends and families gathering in local restaurants, moms meeting in the plaza at Grove Street, children gathering in the vest pocket park by Gofer Ice Cream, and office workers walking to lunch at Uncle’s Deli. Penny and I started a tradition of Friday night concerts in downtown in 2009, and now hundreds of people show up on some Friday’s to enjoy the concerts and gather with friends. It seems to us that so much progress has been made over the last few years, all of which has been in keeping with the personality of our town. Improve the aesthetics of downtown Darien, by replacing older and unattractive structures like those around Corbin Drive with new, beautiful buildings which will stand the test of time, designed by master architects and built with the highest quality of materials. Create open space, and a gathering place for the town of Darien. As you will see, we have incorporated into our concept a plan for a nearly ½ acre plaza in the midst of the project, a new town green. This open space would be designed to accommodate the farmers market, community events, and, potentially, an ice rink in the winter months. Improve the flow of automobile traffic in downtown Darien. This is a key goal. In much of the block between the Bank of America building and Corbin Drive, there is currently back-out parking into the Boston Post Road. This parking situation is dangerous, causing many accidents; it is unsightly, and a negative influence on traffic in the area. In connection with our project, we would propose to eliminate this parking and create, instead, parallel parking, beautiful, walkable sidewalks, with only one or two curb cuts. Enhance the walkability of downtown Darien. As you will see, we will also be proposing the installation of a street in downtown Darien which will run parallel to the Boston Post Road. This street will offer to the pedestrian an attractive passageway, free of curb cuts, along the new storefronts we would create. This plan creates depth in the downtown, and addresses this perceived weakness. We can create, with this project, a road like Elm Street which will run along the new town green, to Corbin Drive, and on to Center Street. We have also put some thought into the idea of extending Grove Street to Leroy Avenue, which would enhance the pedestrian experience on that side of the Boston Post Road. Improve the experience of parking in downtown Darien. As a part of our project, we are proposing to create additional on-street parking, structured parking, and underground parking. On-street parking would primarily serve shoppers seeking to get in and out of stores in the area quickly. The underground parking would primarily serve apartment residents, office tenants and retail employees. Additional structured parking we would propose in two areas on-site would serve retail customers and other visitors to the area. We will also share some ideas for creating additional parking in the heart of downtown. At Baywater, we created the first affordable housing units in downtown Darien since the completion of Clock Hill Homes when we built 1020 Boston Post Rd. For that project, we dedicated two out of six units to be rented on an affordable basis for 10 years, without any zoning bonuses or benefits from the Town. We offered these units to the Town because we felt it was the right thing to do at the time. Penny and we, in building 745 Boston Post Road, made the first contribution by a private developer to the newly-established Affordable Housing Trust Fund. In connection with her project on Settlers Trail, Penny will be creating additional affordable housing in Darien. Penny and I have a well-established track record for contributing to the affordable housing stock in Darien, and with this project, we will continue that record. We will be looking at creating affordable units for sale and/or for rent, and we are also researching the possibility of creating a building which could provide supportive housing for adults with special needs. Through our conversations with people like Jayme Stevenson, our First Selectwoman, [State Rep.] Terrie Wood, Peter and Kathy Gogolak and Doug Milne, we have been enlightened as to the need for this type of housing. The waiting list in the state of Connecticut for adult special needs housing today is over 2,000 people long. This is unacceptable to us. As a town, we need to create more and better housing opportunities for empty nesters. We also know that getting more people living downtown would be of material benefit to the businesses located in our Central Business District. The demographic trends in Darien are incredible, but unsustainable. Between 1990 and 2010, the population of the town increased by something like 5 percent, while the school age population increased by 80 percent. We are losing far too many older couples and older adults to Rowayton and New Canaan once their children are through school, simply because we as a Town have not encouraged the development of housing stock which meets their needs. When the Town allowed condominium development in the 1980s, it did so with a fear of overcrowding our schools, and the units built were too small, ranging from 900 square feet to, say, 1,200 square feet. These units are now 30 years old, and do not enable the typical empty nesters to feel comfortable that when their children and grandchildren want to come visit, they can stay together as a family. We would propose to incorporate into our project apartments for sale or rent ranging from 1,500 square feet to potentially 2,000 square feet. Our idea is to create well-designed units with underground parking and no maintenance obligations, which would appeal to the couple wanting to stay in Darien, but desiring to simplify their lives. We have studied numerous examples of projects like this in towns similar to Darien (such as Wellesley, Mass.) where projects of this type have met with great success. This is uncharted territory in Darien, and much of Fairfield County, but we believe that this is an ideal location for this type of housing. One of our goals is to increase the commercial component of the Grand List in Darien, generating more tax revenue without creating increased burden on the school system. Towns such as Greenwich, which have a larger commercial core, benefit from a lower mill rate. Our preliminary analysis of the block from Bank of America to 10 Corbin Dr., and back to the U.S. Post Office, suggests that our proposed project could raise the real estate taxes paid by these existing properties from approximately $280,000 to over $4.0 million, with virtually no impact upon the school system in terms of enrollment. We don’t think that the town has material risk of families occupying the units we propose to build, and therefore we believe that this project creates significantly increased tax revenue with limited associated expense. And that says nothing of the impact upon the quality of life of our residents, the potential positive impact on the value of other commercial properties downtown, and the potential positive impact on residential values if we, working together, succeed in creating a unique destination in downtown Darien that our residents, and nearby visitors, will want to experience. Finally, I think that Penny and I have established our reputation as people who help other local people build businesses in Darien. Some of the businesses that we have helped bring to Darien in the last few years include the Darien Toy Box, Folly, Espresso Neat, Kirby & Company, Wendy’ Closet, Spree, Wiggles & Giggles, Everything is Rosey, Green and Tonic, Chunky Pam’s, Beadz Boutique — the list goes on. We have carefully curated the mix of stores which occupy our properties in downtown, sometimes working for years to find the right space for the right retailer. We believe, fundamentally, that the downtowns of New Canaan, Westport, and Greenwich, in particular, are far ahead of us in terms of their evolutions as shopping districts. Those downtowns are now mostly dominated by national retailers paying very high rents, nearly three times the rents prevalent in downtown Darien. In Greenwich, the luxury international retailers are now pushing the national retailers out given their willingness and ability to pay the highest rents. We believe that Darien has an opportunity to continue its tradition as a downtown shopping district populated with locally-owned retailers providing higher quality service. I think it is appropriate to acknowledge, as well, that the Darien Sport Shop has long served as the anchor to our downtown, and with the passing away of Steve Zangrillo recently, I think that many of us have been reminded of how important it is to keep this tradition alive. Penny and I acquired two of the Corbin properties from Steve Zangrillo and his partner, Dr. Ed Felder, in 2007, and we committed to Mr. Z and Dr. Felder at that time that we would do our best to improve downtown Darien. In connection with this project, we intend to continue this merchandising strategy, bringing the best locally-owned businesses to Darien. We have also been engaged in a discussion with a retailer whose name I have been asked not to divulge because we are still in negotiations, but I could describe as the original retailer of New England (headquartered in Maine). This store would anchor the project, with a 20,000 square foot store, surrounded by our existing local retailers and new stores we would seek to bring to Darien. This firm, which is privately-held by its founding family, represents the quintessential New England retailer, and in our view, has the perfect retailing personality for Darien. The company is known for its high level of service, its almost unrivaled customer satisfaction programs, and the quality of products it offers. We also envision attracting other artisanal food stores into the project, such as a fine wine store, a cheese shop, a baker, and a craft butcher. We have been in dialogue with some of the highest quality food retailers in the region, all of whom have expressed strong interest in getting involved. So now, I will share with you the answer to the question “what keeps you up at night?” (other than fear of paying for braces for my four children, college tuition, weddings, and travel lacrosse programs). Penny and I have been working for over 10 years on the assembly of this site, which was owned by 10 different partnerships involving nearly 20 different families. There was one family that threatened to call the police on me if I ever called them again to ask if they would consider selling us their property! We reached an agreement to acquire the last property at the end of 2014, and within days of reaching that agreement it was announced that General Growth Properties, one of the largest mall developers in the United States, is going to be building a 700,000 square foot mall at the intersection of Route 7 and I-95 in Norwalk, 3.8 miles away from 10 Corbin Dr.
General Growth announced in December that their project will be anchored by a 150,000 square foot Nordstrom’s, and a 150,000 square foot Bloomingdales department store. I remember when the Stamford Town Center opened up in my later high school years, and the family-owned retailers along Bedford Street in Stamford were all closed within two or three years if my memory serves correctly. 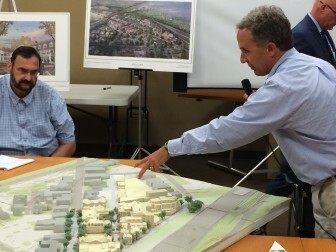 I worry about this project, and its impact upon our Darien retailers. You can say that Darien people don’t like to shop in malls, and they prefer to shop locally. Generally speaking I agree with that statement, but many people will divert some of their spending to a new and proximate mall, just as many Darien residents today shop at the Westchester Mall or the Stamford Town Center. We would like to get our project moving and get it built before the 95/7 Mall project is completed, so that our retailers can get their legs under them before this mall opens. General Growth is in the zoning process now, and Norwalk seems generally receptive to the idea. They are working through traffic concerns and other matters, but it appears likely to me that the project will advance. I think that it is prudent for us to assume that it will. My belief is also that if we do nothing to improve the presentation of our retail alternatives, in this more competitive environment, the opening of the Norwalk mall would have a far worse impact upon our downtown business district. So I believe that we almost have no choice but to get moving. And we need your help to understand this, and to work with us expeditiously. We will move as quickly as you will allow us to. We own the land now, and we have the ability to raise the financing. We believe that we have a good idea, developed with support from some of the best minds in the real estate business. Lastly, I want to tell you that since 2006 or so when I started to work on this project, it has occurred to me daily what a privilege and an honor it is to be able to work on such an important project, one which could have such a meaningful impact upon my hometown, and upon the lives of my family, my friends, my children’s friends, and so many acquaintances. I will never be able to find the words to describe the pressure that I feel to get this project right. We pour our hearts and souls into the projects that we work on, I think that those of you who know us realize this. Penny, my team and I feel blessed to have been given the chance to work with your commissions on so many great projects over the years. I just want you to know that we will do all that we can to ensure the success of this project, and we thank you for your consideration and support in the months ahead. There will be debates, discussions, agreements and disagreements. There will be people who call you and say that our ideas will ruin Darien and its character. I want you to know that we would never, ever advance an idea that we thought had the slightest chance of having negative repercussions. We all know that change is hard, and harder for some than others, but in today’s day and age, to choose not to change and evolve is far riskier a strategy. We have to adapt to the environment around us, and this is not easy as New Englanders! I know that what we will propose to you tonight may seem overwhelming at first, but please, keep an open mind, think about the goals we have laid out against the town’s priorities, and let’s find a way to work together to move downtown Darien to the next level where it can be worthy of the great people who live here. This is a terrible idea, why do you want to ruin Darien like this? I hope this project is DOA, I know I will do everything I can to stop this travesty.